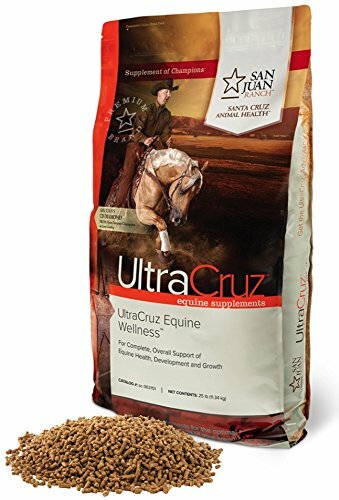 UltraCruz equine Wellness is an Apple flavored foundation Wellness formula for total body health, containing essential ingredients to support health on all levels. It offers support, on the cellular level, for healthy joints, bones, hoofs and skin, while also reinforcing healthy immune, digestive and Reproductive systems. Flax oil, a natural source of essential omega-3 fatty acids which are crucial for new tissue formation, supports digestive efficiency, and is an excellent caloric addition to regular grain intake. This unique formula also contains vitamins a, D, E and B12 to support a healthy coat and silicon, an element that may support healthy cartilage and connective tissue formation. Easily digestible minerals such as biotin, l-lysine, copper, zinc, cobalt and manganese work together for optimal Hoof health. Vitamin E, a fat-soluble vitamin, has been implicated as a cofactor in glucose production and may help support the immune system. Vitamin C (ascorbic acid) functions primarily as an antioxidant.